Dr. Alexis NIZIGIYIMANA is a public health specialist with 10 years of experience in reproductive health, primary health care, community health services, program management, training, operational research, and clinical service delivery. Dr. Alexis is a Co-Founder/Co-chair and Legal Representative of Village Health Action. In this position, he is primarily responsible for coordinating technical aspects of VHA program in the area of Non-Communicable Diseases (NCD), Reproductive health, HIV and harm reduction, and for overseeing program implementation. Working in partnership with the MoH, US Embassy Burundi, WHO and ABS, he is involved in management decisions and directions, and represents the VHA both in Ministry of Home Affairs and on numerous technical committees organized by the MOH, and donor organizations, where he was able to include the harm reduction/HIV in the National policy and help in adoption of tobacco law in Burundi in 2018. Dr. Alexis recently Co-founded a Burundi Medical Journal, which is a multidisciplinary peer-reviewed, open-access, fully online journal that is published at least two times a year, where he served as an Editor-in-chief. Dr. Alexis published over 10 scientific and technical papers in peer-reviewed journals and technical publications. He also worked with World Vision International Burundi at various levels and was responsible for the integrated health, nutrition, WASH and food security program management, training, IEC, supervision, and coordinating activities with governmental agencies, and NGOs. During this period, he was primarily involved in child survival activities including working as in the introduction of Integrated Management of Childhood Illnesses (IMCI) in two districts. As a clinical medical officer in Psychosociology Clinic of drug users, he was involved in the training of trainees in the area of Tuberculosis, hepatitis C&B, HIV, Harm reduction and conducted several operational research activities on HIV associated with substance abuse where more than 2000 drug users got treatment. 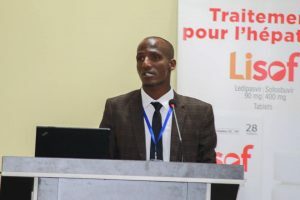 Dr. Alexis is currently acting as Program manager of Burundi Non-Communicable Alliance, in this position, he participated in the elaboration of a benchmark survey, Strategic plan on NCD prevention and control in six East African country in 2017. He also conducted a national community dialogue, our view our voice and UNHLM advocacy in 2018. He successfully expanded the Burundi NCD Alliance from 4 associations up to 20 associations members which account for more than 20000 members and patients living with NCD in 2019 in partnership with Global NCD Alliance, East African NCD Alliance and Danish NCD Alliance. In a voluntary capacity, he is providing technical support in the area of Medical English, CT training and research to the health care providers and Graduate students from Burundian public and private University at English Medical Center with more than 5000 Graduates trained in partnership with US Embassy Burundi and Regional English Language Officer (RELO).Dr. Alexis awarded a grant competition from the RELO and US Embassy to run an English for Health science and health care professional project, where he successfully opened up four branches of Medical English chapters in four Universities of Burundi and organized the 1st regional scientific conference in Burundi, with more than 1000 beneficiaries. He has a huge experience in working with the Global NCD Alliance, Global Funds, Danish NCD Alliance (DNCDA) and Burundian Alliance against HIV/AIDS (ABS). He served as president of Young professional of Young professional chronic Diseases Network from 2015 up to now. Dr. Alexis is receiving an IMPH from the Hebrew University of Jerusalem, Israel in 2019, his MD from the Burundi University of Medicine in 2016, Mandela Washington Fellow in USA in 2017, and several certificates from different in-country and abroad training including Quality improvement, Clinical trial, and public management, Monitoring and evaluation and public health city. Dr. Alexis is particularly interested in bridging the gaps between global health research, policy and interventions for stronger health systems in Sub-Saharan African countries especially in the areas of cancer, NCD and Nutrition, the outbreak of infectious diseases, reproductive health and climate change.